ALL GONE! Cold Steel Knife Rights 2018 Limited Edition "Shall Not Be Infringed" Swift II Flash-Tek Assisted Opener: $235 Retail Value Without Engraving - FREE* to $500 Donors - ALL GONE! This Cold Steel Knife Rights 2018 Limited Edition "Shall Not Be Infringed" Swift II features unique laser engraving. On the front is the Knife Rights Sharper Future™ logo with the enduring powerful conclusion of the Second Amendment, "shall not be infringed," engraved in a script based on the original hand-written Bill of Rights. This celebrates both the "Essential Rights" part of Knife Rights' "Essential Tools - Essential Rights™" slogan and Knife Rights' ongoing commitment to fighting the Second Front in Defense of the Second Amendment™. The back side is engraved with our acclaimed "All Knives Matter!®" trademark. ALL GONE! Featuring patent pending Flash-Tek technology, the Swift II has the astonishing speed and smoothness of an assisted opening knife, but with the strength you have come to expect from Cold Steel and from Andrew Demko! 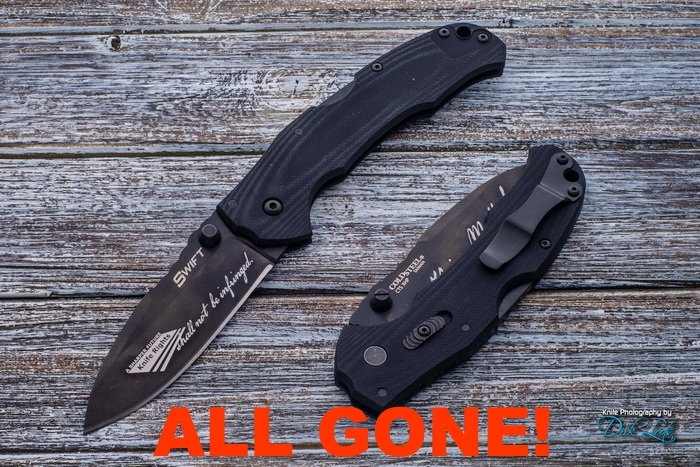 The Swift II features a black DLC (Diamond Like Coating) coated blade manufactured from American CTS XHP Alloy and honed to a fine cutting edge. The modified spear point has a pronounced recurve on the spine, which not only reduces the knife’s profile when closed but creates a comfortable and functional finger or thumb ramp for detail and precision work. The Swift also features ergonomic 3-D CNC machined and bead blasted G-10 handles that are a joy to hold and easy to use, with or without gloves Our "XS" (Xtra Safe) safety keeps the blade securely locked when closed, while also acting as a secondary locking feature for even greater levels of strength when open.